Our Santa Paws Coat is warm and stylish. Are you looking for a holiday gift for a dog owner? The Posh Puppy Boutique Christmas Shop can help. We have clothing to fit nearly every dog plus toys, treats and accessories every pooch will enjoy. One of our most popular items for boy dogs is our red Santa Paws Coat ($45), which comes with a matching hat. This Pooch Outfitters design is a red trench coat with belt and buckle details. It also doubles as a harness, since it is equipped with a D-ring. Size options range from double extra-small to extra-large. Special lengths—such as for dachshunds—and girths—pugs, for example—for different breeds are also available. Girl dogs can get a similar, but very feminine, outfit in our Santa Paws Dress ($57). Also supplied with a matching hat, it has crystal appliques and a bright white bow. A great combination is a Santa Paws Coat for your boy dog and an Elf Girl Dress ($40). The green and red dress comes with a matching elf hat and green leash. Like the Santa Paws Coat, this dress is available with several size choices the meet the needs of different breeds. For younger dogs, consider a green Elf In Training tank top ($25). It is made with soft cotton with just a hint of lycra and is made in the USA. For another option, consider our complete Santa Suit ($21). It comes with matching hat, beard and booties, complete with matching bells around the middle. It comes in small, medium and large sizes, making it perfect when you are unsure of the dog’s size. Add a chuckle to your Christmas festivities by topping your favorite dog with our Official Gift Unwrapper Hat ($12). It is red with a white pom. Is your pooch a lover? Let him go under the mistletoe wearing our Kiss Me Dog Tank ($30). Made in the USA, this stretchy cotton ribbed shirt is machine washable and adorable too. These and thousands of additional gifts for your favorite dog or cat await at the Posh Puppy Boutique Christmas Shop. 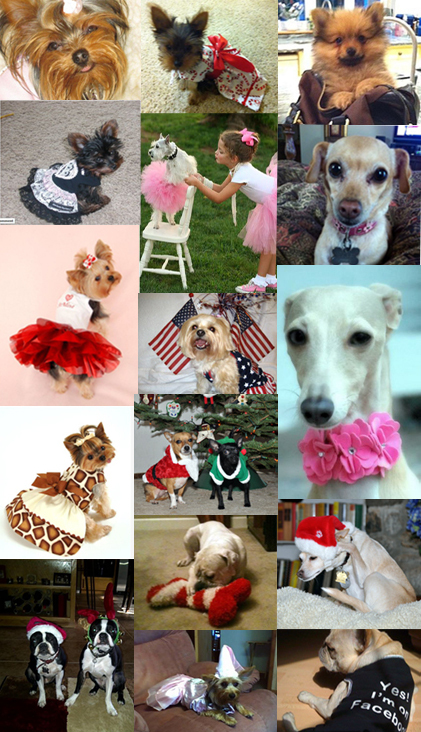 For many more ideas, visit the Posh Puppy Boutique Christmas Shop or call us at 888-837-5230. 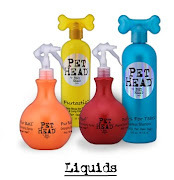 You can also visit our main online store at the Posh Puppy Boutique, with thousands of dog and cat related items. Stay updated on all the action by following us on Facebook and Twitter. Find the perfect holiday gift for your pet or a friend’s by shopping now at the Posh Puppy Boutique Christmas Shop. Do not let price get in the way of buying the perfect gift because we have a Layaway Plan. Our Happy Holly Flounce Dress ($700) is made with ruby red silk panne velvet with a red taffeta plaid lining. It is highlighted by Czech pressed glass leaves and crystallized Swarovski items along the center back and waist. It comes with a removable Diva Dangle. Size options for this “Made in the USA from imported materials” dress range from double extra small to large. Order soon since it takes 2-3 weeks to make and ship. Note: leashes are sold separately. Another perfect holiday doggie outfit is our red silk and satin dog harness ($320), which is covered with layers hand cut red satin rosettes. The harness is embellished with red Swarovski crystals and topped with a red satin bow. This custom-made item can up to three weeks to ship, so order it now. Sizes range from extra small to extra large. Our Jingle Bells Necklace ($106) is the perfect accessory for your dog’s holiday dress. It features emerald and siam Aurora Borealis Swarovski crystals surrounded by rhinestone-encrusted balls and sterling silver hand-made bells. It also has a sterling silver heart lobster clasp. Boy dogs can get equally fancy and be just as colorful as the girls when they strut their stuff in our Royalty Tuxedo with Bow and Tail ($200). This maroon satin tux comes complete with a matching rhinestone bow tie and white shirt that uses three rhinestones for buttons. Topping it is a rhinestone boutonniere. Girl dogs can get in the act with a matching dress. Let your smaller dog sleep in comfort and style by gifting them with a Sweet Dream House ($135). Sweet dogs will love the gumdrops and peppermints around the windows. Owners will appreciate that both interior and exterior fabrics of this collapsible design are washable. It measures 18 inches by 16 inches by 19 inches. 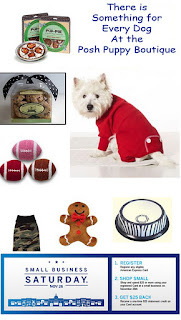 Make this holiday season one your pet will never forget: get their gifts at the Posh Puppy Boutique Christmas Shop. 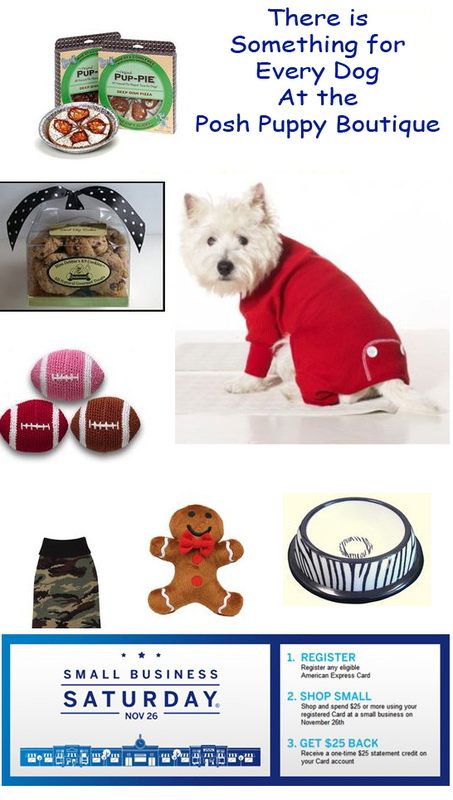 Here we have more than 900 great gifts covering everything from clothes and collars to toys and treats. Your girl dog will sparkle in this Black Velvet Dress ($185) complete with Swarovski snowflake and black velvet rose. It has three layers of black tulle, a full lining and Velcro attachments. Boys might prefer our brown Nordic Farisle Knit Pattern Mock Neck Sweater ($35) that will keep them stylishly warm on cold wintry nights. Add some Christmas sparkle to any outfit with a Foxy Metallic GLITZ Collar and Christmas Tree Charm ($35) available in green or red (with a candy cane charm). The collar and buckle are adorned with Czech crystals and add both color and style to any dog. Keep your pup entertained by playing fetch with a Christmas Henrietta toy ($12 for small, $20 for large) a latex chicken dressed in halter, skirt and black boots. Decorate your doors with a dog-friendly holiday wreath. Among your many choices are our Large Rawhide Green Snowflake Bone Wreath ($110) made of numerous chewy 100 percent beef rawhide bones. They look great year after year or you can dismantle them for your dog’s enjoyment. Another option is our Small Biscuit Red and Green Swiss Dot Dog Treat Wreath ($70) holding a bunch of edible dog bones. It’s also available in a larger size($90) and a tiny version ($50). Put your pet’s presents in their own soft fleece Personalized Stocking ($48) complete with an applique paw print and your dog’s name. These stockings are available in pink or red. Don’t be a turkey and miss out on the Posh Puppy Boutique’s special Small Business Saturday 25 Percent Off Sale on Saturday, Nov. 26. You can shop from the comfort of your computer and save, save, save on all kinds of gifts and goodies for your favorite four-legged friends. American Express credit card users can even get a $25 credit on their next statement, though certain restrictions apply. · Holiday Apparel: Check out our Deck the Halls Sweater ($25) in pink or blue. Available in sizes from extra-small to large, it features a plush snowman with real buttons, a turtleneck design, ribbed trim and leg straps. · Holiday Toys: Let your dog have their own Gingerbread Man ($12). This soft plush toy with squeaker will keep any size dog entertained. · Holiday Collars, Harnesses and Leads: Your dog will be the life of the holiday party when he or she arrives sporting this Jingle Bells Party Collar($14) with red and green accents and bells. · Holiday Accessories: Some of Santa’s elves have four legs. Turn your pet into an elf with this Elf Hat with Ears ($10). Featuring wide horizontal red and green bands, this hat is available in small, medium and large sizes. · Holiday Treats: Our Naughty or Nice Treat Box ($23) contains six treats in a 6-inch by 8-inch clear lid gift box. Each treat is made with handmade dough and decorated with all natural yogurt chips. · Hanukkah: Take a look at our Star of David Rhinestone Coats ($45) available in black, red and pink. These coats feature a Star of David outline on the back. Dogs of any size from extra-small to triple extra-large will enjoy these warm coats on cold wintry nights. This is just a tiny fraction of our thousands of pet products available for sale, many of which qualify for free shipping. And don’t forget: the Posh Puppy Boutique has a layaway plan, too. Call us at 888-837-5230 with any questions, visit us online at the Posh Puppy Boutique or follow us on Facebook and Twitter. American Express cardholders can save an extra $25 on Saturday, Nov. 26 only. Christmas is approaching and what an amazing time we have to look forward to! The Christmas season is the perfect time to dress up your pet dog in a I Love Santa coat ($85.00), in a Santa Sleigh Hat ($19.00) , or to adorn him with a Reindeer Suit with Booties & Antlers ($22.00) for holiday fun. You can browse our dog boutique for Christmas Collection. Where you have sections of adorable and festive dog Christmas costumes and holiday dog clothing to find just the right outfit for your dog. We have selected a variety of fun holiday dog costumes to choose from the will be sure to bring a smile to every ones face. With all the enthusiasm of Christmas shopping; with all the traffic jams since people are stepping up to get their gifts and Christmas decorations; and while the cold pinch at their ears and noses. You can leisurely sit at home and brows through dog boutique and make your selections with a mug of Christmas cheer and your best friend curled up at your feet, all warm and cozy. Just remember to bookmark the page and come back often. 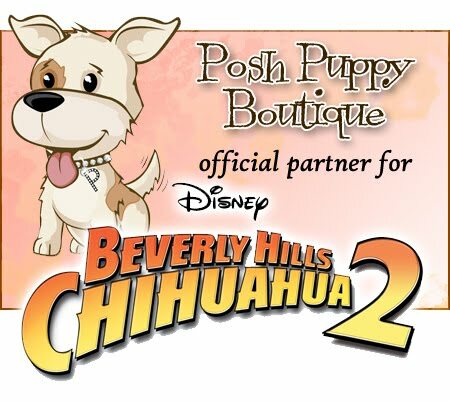 Think 25 on the 26th as in save 25 percent on every Posh Puppy Boutique item when shopping on Saturday, Nov. 26. Save 25% and $25 on Saturday, Nov. 26. In addition to our special Small Business Saturday Sale (click on the preceding link for details and exclusions), American Express cardholders can get a one-time $25 credit on their statements by using their cards when spending $25 or more at the Posh Puppy Boutique that day only. Our Special Small Business Saturday Sale is simple: enter the coupon code “SHOP” when making your purchases and save 25 percent off every item for dogs big and small. One way to spend your American Express savings is by keeping your pampered pooch comfy and cozy in our red Long John Thermal Pajamas ($25). Made with 65 percent polyester and 35 percent cotton, these machine-washable PJs have a back flap and large buttons. They are perfect for cuddling in front of a fire. Outdoor hounds might like a knitted green Camo Sweater ($30), available in sizes from teacup to extra-large. It has a solid color ribbed turtleneck, sleeves and hem and a high-cut, stay-dry belly. Relax and enjoy your favorite pizza while your pet has their own slice, a slice of Chip’s Chicago Deep Dish Pizza ($15). Made with natural organic ingredients, this dog-friendly pizza contains natural pumpkin, ground ginger, peanut butter, organic rolled oats and other human-grade products. Give your pet their pizza slice in Safari Collection Dog Bowl ($10), which is sized differently for various dogs. Depths range for 1.5-3.5 inches with openings varying from 6-12 inches. Top off your pet pizza with a dessert of Neimun Barkus Carob Chip Cookies ($15). Each assortment has peanut butter, cheese and chicken cookies made with organic ingredients. When your pet is done munching, let them play with a Gingerbread Toy ($12), a soft plushy with squeaker. Another great option for indoor fun is tossing a Crochet Football Toy ($10), which is available in pink or red. Made with all natural cotton, these 4-inch toys are handmade. Take advantage of these special savings one day only: Saturday, Nov. 26, 2011 and only at the Posh Puppy Boutique. Remember, the Posh Puppy Boutique also has a layaway plan.